OK I think that I have done it again - started an idea that has taken on a life of it's own. There was something about the concept of the wind fathering, in this case flowers - Anemones, daughters of the wind, that made me think of the creative power of the wind. The Ancient Greeks must have found divine characteristics in man, because many of their myths describe sexual encounters between the gods and mortals. The offspring of these unions were often amazing individuals. Remember Leda and the swan. The swan was actually Zeus in disguise, who, as the story goes fell in love with Leda and in order to escape the jealous gaze of his wife Hera, he disguised himself as a swan. As a swan he was also able to trick Leda into protecting him from an aggressive eagle. Well as she cradled him in her arms, he worked his magic, which in time produced a daughter, the beautiful Helen of Troy. OK, I starting out talking about the wind, which is a powerful force, not unlike that of a god. Now what if the wind were really a divine spirit, a god in disguise. Might it then be able to impregnate individuals, that were mesmerized by its power. Think of all the times that you have found in the wind an irresistible force - a creative force, perhaps. I have visions of winsome souls on castle walls, cliff tops, barren moors, being literally consumed by the wind. What will their creative offspring be? Maybe not a lot about knitting - but a little about the creative force and where you might find it. 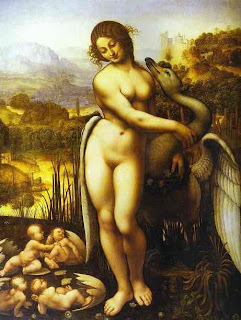 Here is a painting, originally by Leonardo Da Vinci of Leda and the swan. and here is a poem by W.B. Yeats, which one critic called the most important literary work of the 20th century...maybe he too was inspired by the wind.